First Descent is NOT an action-packed snowboarding flick with tons of Hollywood stunts and special effects... and that's kinda too bad, 'cause that would have been a little more exciting. Nope, First Descent is a full-on documentary about snowboarding. There are two basic segments here, the history of snowboarding and a present day trip to Alaska where some of the best snowboarders in the world are going to take on the mountains of Alaska. These two segments are interlaced together throughout the whole film, which I definitely think was the right way to go. The constant switching back and forth kept either segment from getting to stale. Lots of stunts? Yes. Lots of adrenaline? No, at least not for me. Lots of talking? Yeah, that too. We follow these five expert boarders, Shaun White, Hannah Teter, Terje Haakonsen, Shawn Farmer, and Nick Perata from the start of their 15 day stay in Alaska. Some are the pioneers of snowboarding, and some are kids who the best-of-the-best at freestyling, but have never even attempted a mountain slope. I must admit, it was refreshing to see the kids show their fear about trying out a mountain, especially after we get to see some of the absolutely amazing stunts they can do on a half-pipe. After watching them launch into the air, twist, turn, rotate this way and that way and then land smoothly, you just think these guys are like superheroes, like there's nothing that can phase them. But then you watch them and see and hear their apprehension about trying to snowboard down a mountainside, and it brings it all right back to, that these are real people after all. For the history portion of the film, I was a little bit disappointed, but that may just be because of the lack of history the sport has, going back only like 25 years or so. I wanted to know more, but maybe there just wasn't any more to know. As they say in the film, it evolved very quickly, so showing the history behind something that doesn't have a whole lot of history must have been hard. They showed some video clips of early snowboarders, like one where there was a rope attached to the front of the board and that seemed to be how the guy steered it, and then onto the racing aspect with boarders just trying to go as fast as possible. They were interesting clips to see, but not much was said about it... which is weird because there sure was an awful lot of interviews and talking. And who invented the first snowboard? Unfortunately, no one seems to know. The present day Alaskan trip was a lot-bit disappointing. There were a lot of days where they couldn't go out and get any action, and it really wasn't until towards the end of the trip that they actually got to go out and helicopter up to a mountain top. The snowboarding down must have been terrifying for the freestylers, but to anyone watching it was pretty much similar to those video clips you see on RealTV with the guy on the skis going down the mountain (and usually falling half-way). There was no total wipeouts here, but there were a few close calls when areas of snow started breaking away. I did like the part where they build their own snow ramp and started jumping that, but again it was really nothing I haven't seem before several times. All-in-all, there really isn't a whole lot of snowboarding in this film. So after watching this, did I earn a new respect for snowboarders? No, but that's because I already had a lot of respect for them. I mean, that **** looks hard! Those dudes are awesome and nobody can take that away from them. But this film just isn't that awesome. It would probably be worth a rental, but I don't ever see myself sticking it in for another watch. Of course, if you're a snowboarding fan, or a fan of documentaries in general, then you may have a higher opinion of it that I do. Oh yeah, and there are a few extra features on the disc, such as featurette called Ak and Beyond where you get to see how the cast and crew dealt with the snowy conditions and filming the snowboarding sequences, and then deleted scenes, extended snowboarding sequences, and another featurette where Nick Perata goes over what to do and what not to do when boarding down the Alaskan mountains. They were all pretty much about as engaging as the movie itself, which was mildly entertaining. 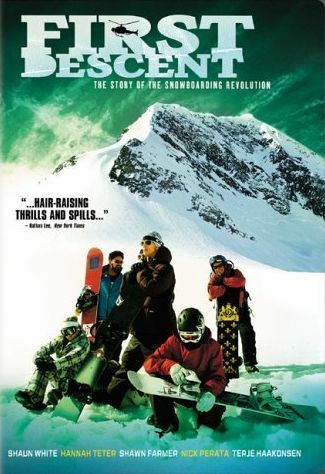 First Descent was released by Universal Studios Home Video on DVD starting February 21, 2006.